Thomas William Dampier, known as Willie, was born in 1844. He was the son of wealthy landowner and glove manufacturer Thomas Dampier and his wife Elizabeth (1774-1864), the sister of William Bide. 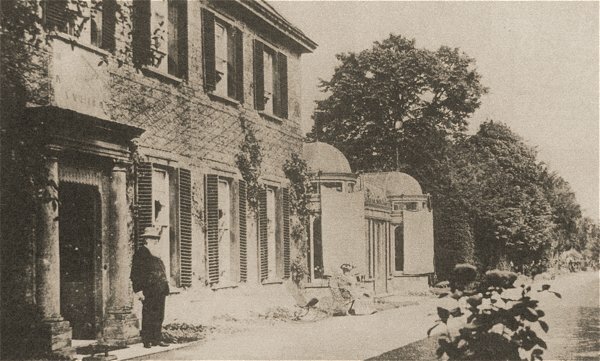 Some time after William Bide died in 1864 Thomas and Elizabeth Dampier moved into his house, Kingston Manor House, with their family. Thomas died in 1876 and his wife Elizabeth died in 1881 after which their elder daughter Elizabeth, known as Bessie, and Willie their only son lived there for the rest of their lives and neither married. 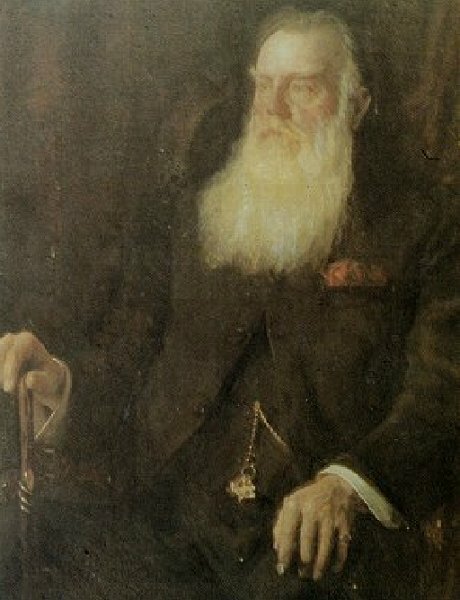 They inherited considerable property from William Bide and Willie added Bide to his surname by Royal License under the terms of William Bide's will. An inscription on a large alms dish in St John's church reads "in loving memory of William Bide who died 7 August 1864, aged 55 years. Presented to St John's church, Yeovil, by his nephew and nieces, Thomas William Dampier Bide, Elizabeth Bide Dampier, Mary Ann W Whetham. Christmas 1881." In the 1880s, after the death of their parents, Willie and Bessie travelled extensively in Europe undertaking long voyages including a five-month tour of Egypt and the eastern Mediterranean in 1882 and then a two-year tour of India, Australasia, the Far East and North America from November 1886 to December 1888. Both brother and sister were keenly interested in arts and history and visited art galleries and museums on the voyages, buying numerous Oriental and Russian works of art. Both were also keen botanists, touring botanic gardens wherever they could and sending home plants for the Kingston Manor greenhouses where grapes, pineapples and orchids were successfully grown. Wherever they went they had introductions to British officials, bankers and merchants who entertained them, booked passages, provided introductions to the local 'British club' and other assistance. Both Willie and Bessie produced journals of their travels which were later published. Willie took little part in Yeovil's public affairs although he did subscribe generously to local charities and to St John's church. He was a Justice of the Peace for Dorset, sitting at Cerne Abbas Petty Sessions by virtue of his inherited holdings at Hilfield where he purchased more farms and added a wing to the small shooting lodge called Hilfield Manor where he frequently hunted and shot. In their later lives Willie and Bessie lived quietly and comfortably at Kingston Manor House, occasionally visiting London where they stayed at the Metropole Hotel in Northumberland Avenue. They were listed there, for example, in the 1891 census as hotel guests (among the 326 guests and 88 staff registered there that night). They both gave their occupation as 'independent means'. 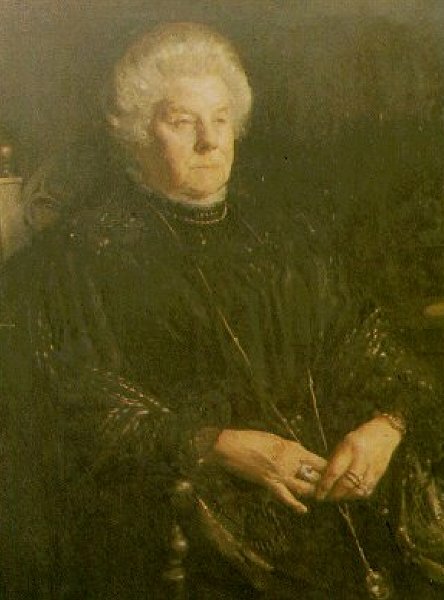 Bessie died in 1915. The choir-vestry and heating apparatus in St John's Church were added in 1915 by public subscription, and the debt remaining was paid by Willie in memory of Bessie, a life-long worshipper in the church. 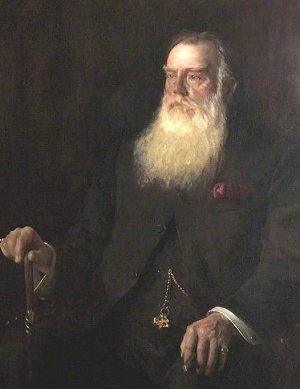 On his death in 1916 Willie bequeathed a large part of the grounds of Kingston Manor House, lying between Court Ash, Court Ash Terrace and Red Lion Lane, known thereafter as Bide’s Gardens, to the town. His huge collection of orchids, many gathered during his extensive journeys, were donated to the Cambridge Botanic Gardens. Thomas William 'Willie' Dampier-Bide and Elizabeth Bide 'Bessie' Dampier photographed in 1907 outside their home, Kingston Manor House. 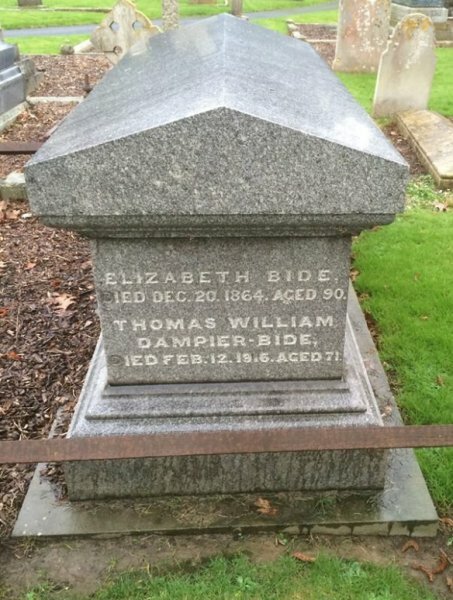 Thomas William 'Willie' Dampier-Bide (1844-1916). Elizabeth Bide 'Bessie' Dampier (1838-1915). The table tomb of Thomas William Dampier-Bide in Yeovil cemetery.